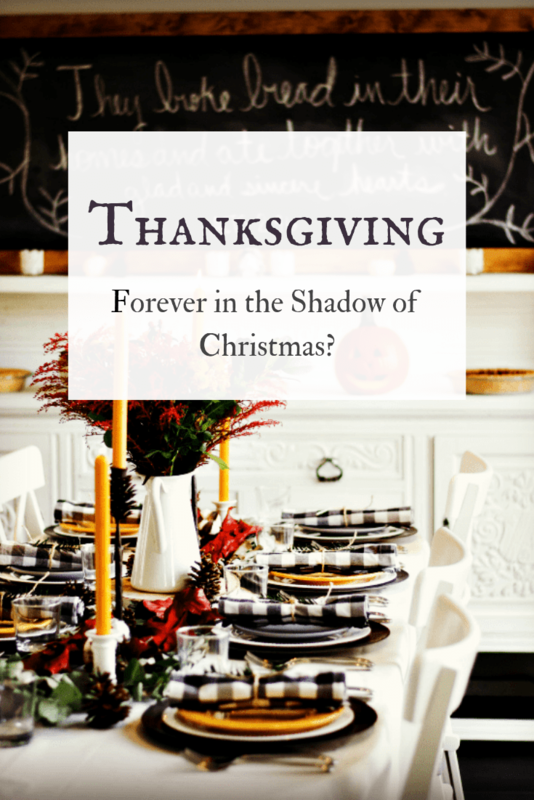 Thanksgiving ~ Forever in the Shadow of Christmas? Lately, it seems like Thanksgiving gets lost in the frenzy that is the holiday season. I mean who hasn’t noticed the stores putting out Christmas decorations around Halloween? Sometimes I’ve seen them being put out right before Halloween! 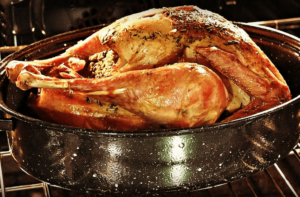 So why does Thanksgiving get overlooked? And why should we reevaluate our treatment of this often downplayed holiday? I think Thanksgiving gets treated like the third wheel because this is the time when many people are planning for Christmas. And with the commercial distraction of Black Friday literally the day after, it’s no wonder this holiday seems to get the shaft. It seems like as the years pass it’s only getting worse. What’s sad is that Thanksgiving is truly a wonderful holiday and as Christians it really should be almost as important as Christmas or Easter. The story of Thanksgiving as we were told in elementary school isn’t exactly accurate. I know, shocking right? This tradition of remembering the pilgrims of Plimoth didn’t get its start in America until the early 1900’s. Prior to that Thanksgiving was celebrated because it was a tradition among the Puritans for giving thanks to God for a successful harvest. It was something that was brought to our country by devout Christians. What made Thanksgiving a truly American holiday was the effect of combining two cultures who shared a similar tradition. The native Americans gave thanks to their creator for a successful harvest and also to ask for an easy planting season the next spring. When these two cultures met at Plimoth they combined their celebrations in an act of friendship to celebrate a bountiful harvest after a couple of years of bad seasons. It wouldn’t be until later that the tradition of giving thanks every year for a good harvest would become an official holiday. In early America, it was left to the states to decide if the holiday was celebrated at all. And by that time it had lost much of its Puritan element and had become a time that families would gather around the table and give thanks for their blessings and bounty. It wasn’t until 1941 that Thanksgiving was established as a national holiday. So why should we revisit the true meaning of Thanksgiving? In today’s culture many things have been deemed bad or politically incorrect, holidays among them (Columbus Day anyone?). Thanksgiving has gotten its fair share of attacks as well. People try to say that the Native Americans were taken advantage of and were decimated because of the colonists. I’m not saying this didn’t happen. But many cultures across the world have been conquered, displaced, and treated horribly by other cultures. It is a fact of human interaction. But this moment in our history was one that should be celebrated. Why wouldn’t you want to highlight the time when two completely different cultures came together and shared a sacred time in peace? So what makes the Thanksgiving meal so special? The traditional foods we share at this holiday have their roots in American history. Turkey was and is a wild game bird that thrives on the East coast and mid-west of America. Our ancestors were true locavores. Not that they had much of a choice, it’s not like they could send back to England for a roast. The other foods served at a traditional Thanksgiving dinner were common among the Native Americans; sweet potatoes, corn, squash, cranberries, etc… So it truly was a combining of cultures. I’ve often asked my husband and daughter why Thanksgiving is their favorite holiday. 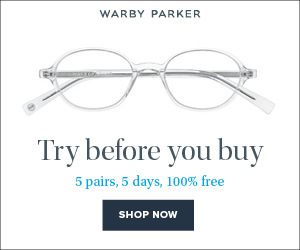 Seriously, with them, it gives Christmas some major competition. Most of the time they’ll say it’s the mashed potatoes. Apparently, I neglect their mashed potato needs, because I don’t make them enough. But usually, they say it’s because of bringing family and friends together and being grateful for all the things we are blessed with. It is truly a time when we should reflect on all of our blessings and the wonderful things God has given us. Even when we have had very little, we knew we were blessed because we had each other. I think it’s because when you do have less to distract you from the important things, it’s easier to see the gifts of our life. 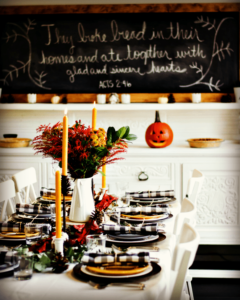 How has Thanksgiving been celebrated in your family? Are there ways you can rekindle the true spirit of this wonderful holiday? I know I have taken a new look at our traditions and why we celebrate giving thanks. So many families treat it like the power up meal before Black Friday. And it really deserves more appreciation than that. The Puritans treated it like a second Sabbath during the week at special times. They never celebrated it on Sunday because they felt it deserved its own special day. That tradition was continued and that is why it is always on Thursday. It became a second day to appreciate God and what he has blessed us with. We should really do the same. So this coming Thanksgiving I hope you can sit down with your family and friends and share the many blessings our Heavenly Father has given us. Join hands in prayer and come together in the joy of the coming holiday season. And give Thanksgiving its proper place as the day of thanks second only to the Sabbath. And from our family to yours we wish you a very happy Thanksgiving!